Being a kingdom man in today’s society is like swimming against the current as you watch all your brothers float carelessly down the stream. As God continues to work on me in my walk with Him, one of the hardest areas I struggle with is properly loving my wife. The issue isn’t in the act of love itself. The issue is in the process of producing adequate and continuous love while fighting against the seeds planted in my generation by sexist role models I grew up with in my environment. As a man of God, it seems that even the church has an erroneous view about how to love your wife. Love your wife as Christ loved the church is the proper way, yet very few men understand this concept. With religion, most men want to dominate their wife with the Word only for their benefit. Men today normally shout, “submit to me and be a silent woman” and this is what they think a good wife is. However, if we are imitating Christ’s marriage we have to remember that He has never treated us in a harsh manner. Where do we get off treating our spouse in such a harsh manner? We need godly men that know how to love their wives and that are willing to submit to Christ. We need men that are dedicated to building powerful families for the kingdom of God. We need men to open up and be vulnerable with their emotions and tender with their affection towards their wife. But how do we get Mr. Macho to open up to his wife? His perception and understanding of his wife must first change. Wives are not maids, inferior, or less than men. Most importantly, women are not men and our designs are completely different based on God’s purpose. Although men are to be spiritual leaders in the home, men are not better or more loved by God. Before God, men and women are equal, both genders bear the image of God. The order is designed to build a proper foundation, but not because men are better, smarter, or closer to God than women. Men were created first with the unique role of being a leader in the home. This may come as a shock to many men, but we are completely equal before God. I understand how you feel since many men and society told us one thing and I am saying something completely opposite. However, the truth will set you free and this will help you to build a powerful marriage by God’s original design and standards. We need to change the way we view the daughters of God before we can properly love them with agape love. Right now, the TV is teaching your sons and daughters how love and marriage is supposed to go. The younger generation are seeing their moms and sisters being abused and they start to believe that is a norm because the men of God think women are less. You’re not fooling God when you say you love your wife, but you tell her to shut up or you ignore her when she is crying or emotional. You can’t pretend it’s not a problem when you lack empathy and you think emotions are weak. Emotions are not weak; it takes a strong man to share his emotions without the fear of being hurt. Don’t let society destroy your marriage. Society teaches men to be sexist, so we will be destined to have destructive relationships. “Men don’t cry.” Wrong. The most powerful men in the Bible, Jesus, David, and Jacob cried. “Men are better than women,” yet men rant about why they have no control over their families and that is because they are functioning outside of God’s design. Submission is seen throughout Scripture. Christ submitted to His Father even though they both were equal. To submit in marriage is to follow a husband’s authority and voluntarily yield to his leadership. A biblical man will not take advantage of his great responsibility to lead his wife. A godly man will love, respect, listen to, protect, support, and lay down his life for his bride. This love resembles the love that Christ has for His bride the church. Are we producing an environment that looks like this? Or are we demanding respect and submission using God’s Word to justify an unbiblical way of submission? Train your sons to love women properly and train your daughters to know the love of a real man with your affection and emotional availability. Show your wife the depths of your heart, communicate with her, and lavish her in affection. 1. Respect your wife. Honor her voice and opinion. Abraham listened to his wife because he respected her. A woman’s voice is important. Respect her voice and give her conversation and communication. 2. Sacrifice for your wife. Jacob dedicated over a decade of his life for his future wife. How much time are you willing to sacrifice for your wife? 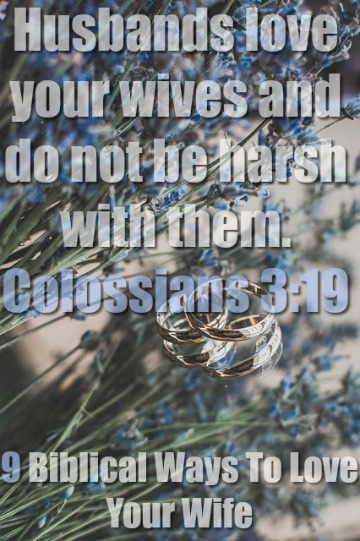 Do not be harsh means (by design) men can’t love our wives in our natural state. Logical thinkers come off as cold dealing with emotional feelers. Men have to be emotionally available to give her proper love and support. Moses honored his wife and didn’t abandon her in the face of adversity when his family bashed her. Always remember, God will protect his marriage institution. 5. Lavish her with affection, love, and compliments; Just brag about her! Proverbs 31 shows how a man brags about his wife. Solomon is a king and he will always give abundantly without question. Song of Solomon shows how to be intoxicated in your wife. Enjoy your wife but respect her body, cycle, and emotions. Your wife is full of potential and purpose. She needs to grow and flourish and you are to help her. Look for where God is working in her life and join in His activity. Dedicate your life to Jesus. That’s the best thing you can do to show your love to your wife. If you have a relationship with Christ, you can truly love your wife. As you both grow closer to Christ, you will both grow closer to each other. Queens are valuable and royal. Treat her as valuable and precious. Society has created roles for women such as cooking, cleaning, etc. Your wife is not your maid. Be willing to help her around the house. Talk to her in a way that she knows that she is special. Christ is the foundation of a biblical marriage. To love our wives in the way that God intended, we need to stay desperate for God. We need to pursue a growing love relationship with Him. Also, we need to grow in knowledge, wisdom, and understanding which helps to produce a thriving marriage by teaching us how to love our wives.